"Jean Jaures" (not particularly monumental being only a "heroic size bust", but a public sculpture / outdoor monument nevertheless). City of Meru, France. 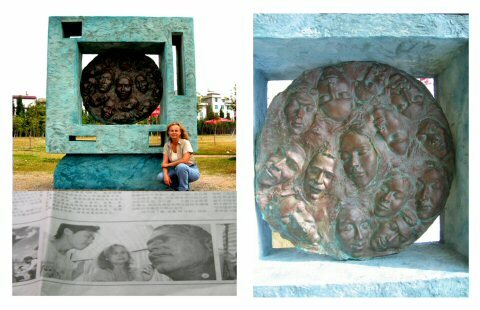 "East Meets West" bronze, 4.2 metres in diameter. World Sculpture Park. City of Changchun, China. 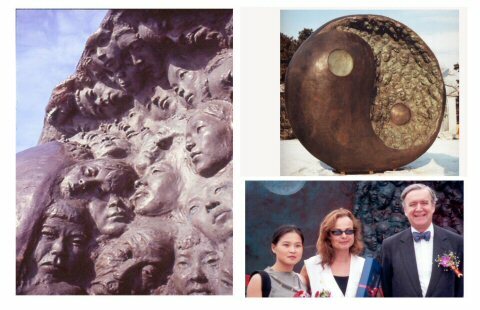 "Fertility" snow sculpture, 4.5 m x 4.5 m, Harbin, China. 3 m x 3 m x 3 m, Chateau de Bois-Guilbert, France. 2m x 90 cm x 80 cm, Chateau de Bois-Guilbert, France. 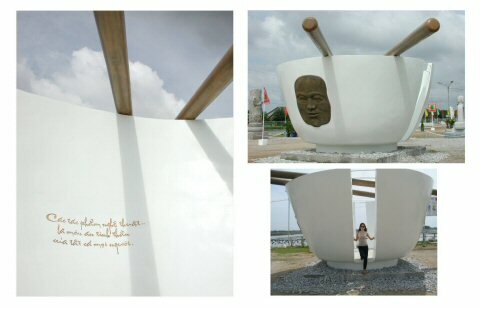 "Rice Bowl & Chopsticks" 30 tonnes of concrete and steel. In Chau Doc, Nui Sam Mountain, An Giang Province, Mekong Delta, Vietnam. 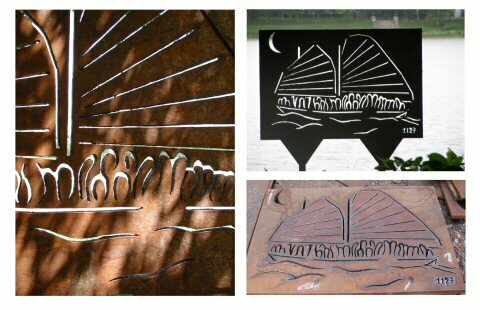 "Boat People" 430 kg of steel. City of Hue, Vietnam, alongside the Perfume River. 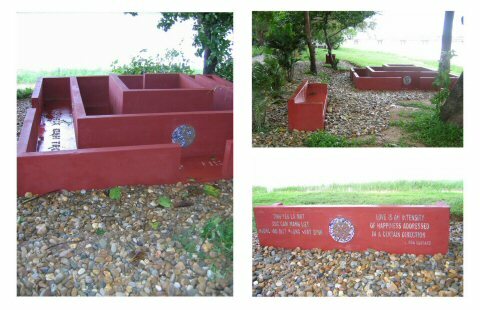 "The Maze of Love and Friendship" over 1500 bricks, 10 bags of concrete and 100 Vietnamese plates in fragments, plus river rocks.... In the city of Hue, Vietnam. 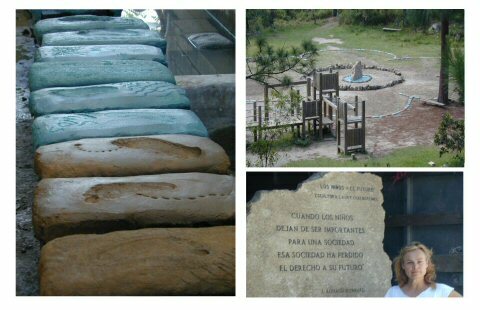 "Children = Future" 200 original stepping stones for "Arte Para Todos" ("Art for All") project organized by the UN and First Lady of Honduras. In the city of Tegucigalpa, El Picacho United Nations Park, Honduras. 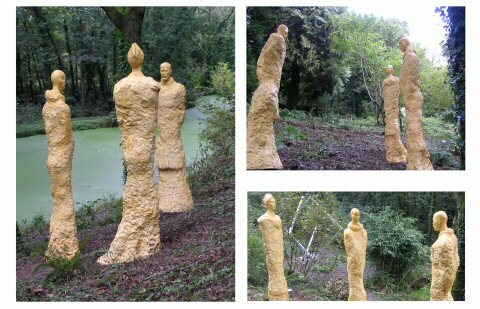 Artists of the Silk Road - trio Created in May 2006 in China, shipped to Canterbury in Kent, and now located in the Broomhill Sculpture Park in Devon - available for purchase via this website or through Broomhill! See also pictures of the making of these sculptures, and exhibition at UCCA in Canterbury. 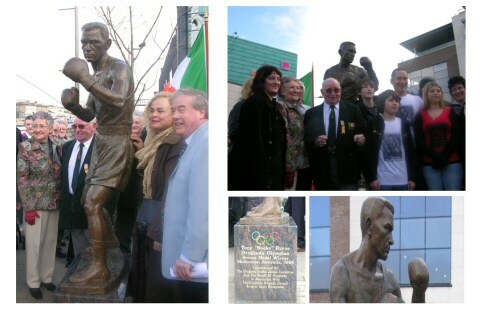 Tony Socks Byrne Monument Commemorative statue commissioned by an Olympic Jubilee Committee in Drogheda, Ireland, unveiled December 2006. Tennis Terracotta Warrior series - 8 larger than lifesize sculptures of the top 8 tennis players in the world commissioned by the ATP for the Tennis Master Cup Shanghai for the tennis event in China in November 2007 - now exhibited at Wimbledon Museum. 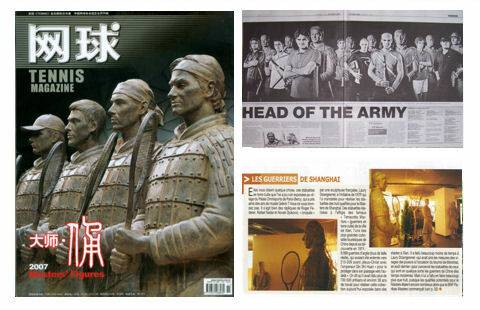 Executed by Laury Dizengremel together with Chinese sculptors Shen Xiaonan and Zhang Yaxi. 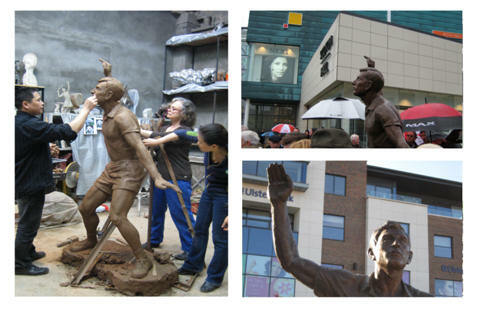 Joey Maher - commemorative statue of World Champion handballer, lifesize bronze sculpture for Drogheda, Ireland, unveiled October 2008. 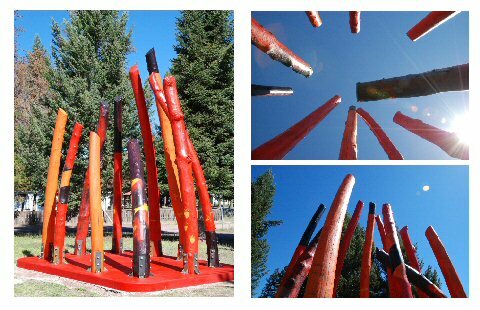 Log Henge - Spirits of the Forest, public artwork in Seeley Lake, Montana (USA) unveiled September 2010.